The BMW M5 is credited with starting the high performance super sedan segment. Now an all-new sixth generation of the BMW M5 4-door sedan will launch in February 2018 equipped with an enhanced V8 engine, a new M-specific, all-wheel drive system known as M xDrive and performance capabilities that surpass all previous generations. 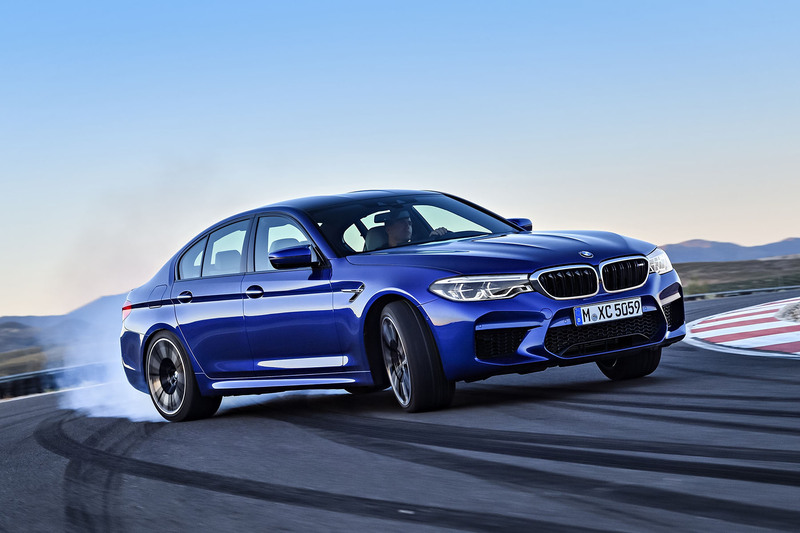 With the new BMW M5 (Type F90), BMW M is continuing a success story that began over 30 years ago and is based on a seemingly simple recipe: luxury through the highest level of performance and comfort. The first generation M5 (Type E28S) was introduced in 1984 and was powered by a 24-valve six-cylinder 3.5-litre engine from the mid-engined M1 supercar. 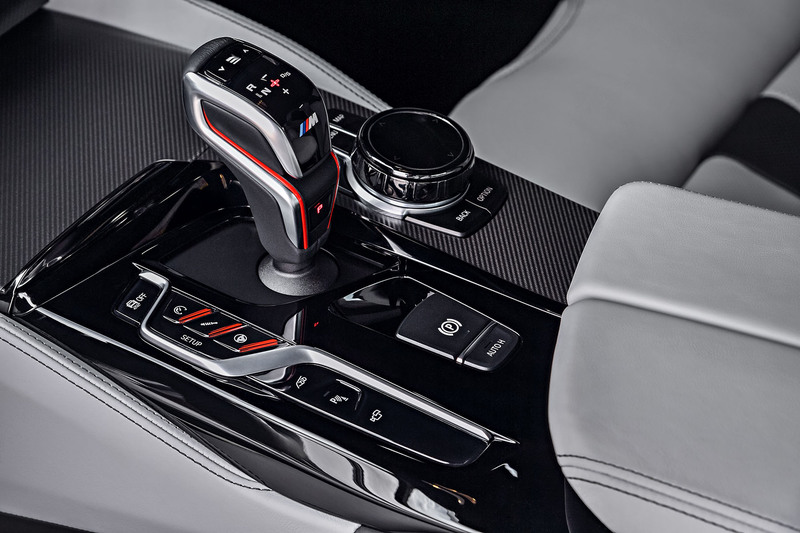 Key to the new M5’s heightened level of performance is the introduction of M xDrive and its adaptability thanks to a central control module and the variety of different dynamic modes that can be selected. When the car is first started, it is in four-wheel-drive mode with the Dynamic Stability Control (DSC) switched on. But it comes with various driving dynamics modes, up to a track-friendly pure rear-wheel drive without DSC. 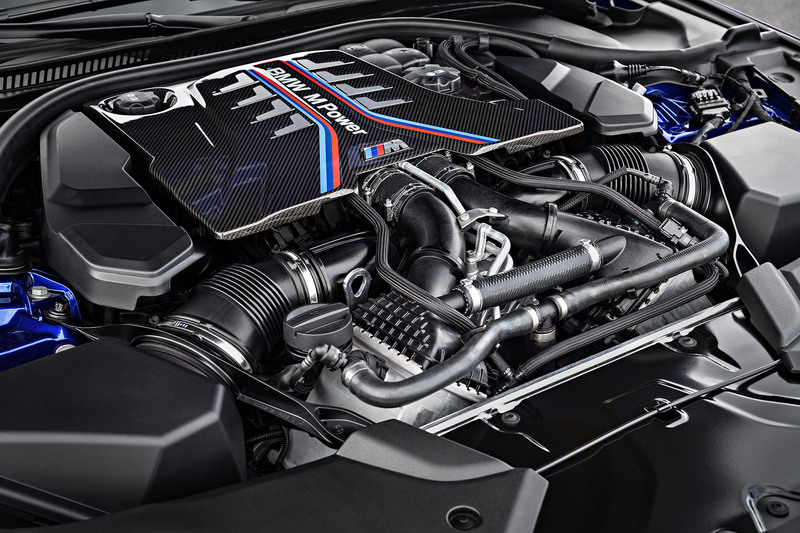 Power comes from the latest 4.4-litre V8 engine with BMW M TwinPower Turbo technology. It delivers a maximum torque of 553 lb-ft, accelerating from 0-100 km/h in just 3.4 seconds, making it the fastest M5 yet. Power is transferred to the road via a new eight-speed M Steptronic transmission with Drivelogic. All of this performance is wrapped in a design that adheres to the form follows function mantra of all BMWs. The front design serves to splice the oncoming air in the most aerodynamic fashion while at the same time providing the breathing and cooling requirements for a 600 hp engine and its braking system, and the downforce required of a high performance saloon. The exhaust manifolds have also been modified to ensure the best transfer of exhaust gas energy into the two turbochargers. Through the use of a resonator between the two rear silencers, the M engineers have also reduced the car’s mass. The exhaust note is flap-controlled and is influenced by the different driving modes to enhance the driving experience further. 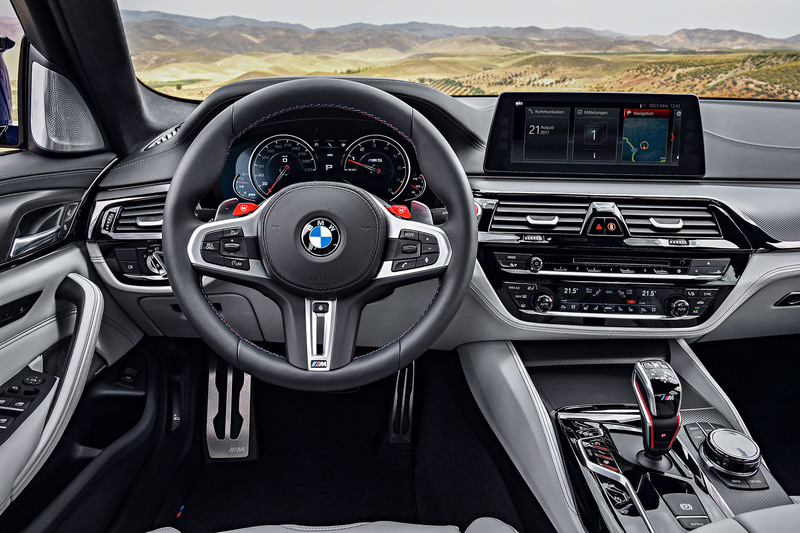 An M Sound Control button allows the driver to reduce noise levels at the push of a button. Power is transmitted to the road via the newly developed M xDrive all-wheel drive system. M xDrive brings the front wheels into play only when the rear wheels reach their limits of adhesion. The main components of M xDrive are based on the intelligent all-wheel drive BMW xDrive system and Active M differential, controlled by a central M-specific vehicle dynamics control system. The Active M differential splits distribution of the drive between the rear wheels. With M xDrive, the DSC intervenes only when necessary in extreme situations, so that the high engine power can be converted almost without power loss. Enthusiastic drivers can configure M xDrive at any time according to their needs. In the default setting with DSC and 4WD switched on, the new M5 is similar to the typical M rear-wheel drive dynamic characteristics when accelerating out of a corner. At the same time, the car remains forgiving. The superior traction of the all-wheel drive system also provides impressive acceleration values from zero to 62mph in just 3.4 seconds and zero to 124mph in just 11.1 seconds. If the driver switches to M Dynamic mode (MDM, 4WD Sport), the M5 becomes sharper and more agile. More torque is fed to the rear axle and the rear wheels give more wheel slippage. This allows controlled drifts and playful handling, but with controlled oversteer. The pure rear-wheel-drive 2WD mode is designed for track use by experienced drivers and is dedicated entirely to pure driving pleasure without restrictive control systems. The new eight-speed M Steptronic transmission with Drivelogic has extremely quick shift times and optimises change points to deliver the best performance. Thanks to a higher final drive ratio, the eight-speed M Steptronic transmission also delivers reduced fuel consumption. It allows fully automatic shifting in “D” mode and sequential switching in “S” mode. This is possible both with the new short gear selection switch on the centre console as well as via M-shift paddles on the steering wheel. The shift characteristics of the gearbox can be changed via the Drivelogic gear shift lever on the gear selector. Drivelogic Mode 1 stands for efficient driving with comfort shift times. Mode 2 supports fast driving with shortened shift times. Mode 3 is optimised for track driving with extremely short shift times. Those who prefer manual shifting in “S” mode can also make multiple downshifts to the lowest possible gear, for example when braking into tight corners. An integrated oil cooler ensures the gearbox is protected even when used on the racetrack. BMW’s M engineers made great driving dynamics and the best possible stability their goal in the chassis development of the new M5. Much of the testing took place on the in-house race track in Miramas in France, as well as on the toughest chassis test track in the world, the Nordschleife of the famous Nürburgring. The Michelin tires were developed especially for the M5, with 275/435 R20s at the front and 285/30 R20s at the rear. They are mounted on light-metal cast Double-spoke bicolour wheels. These wheels are also optionally available in Jet black. Brake pads have been developed using a special M compound, characterised by significantly lower weight compared to conventional cast iron brakes. 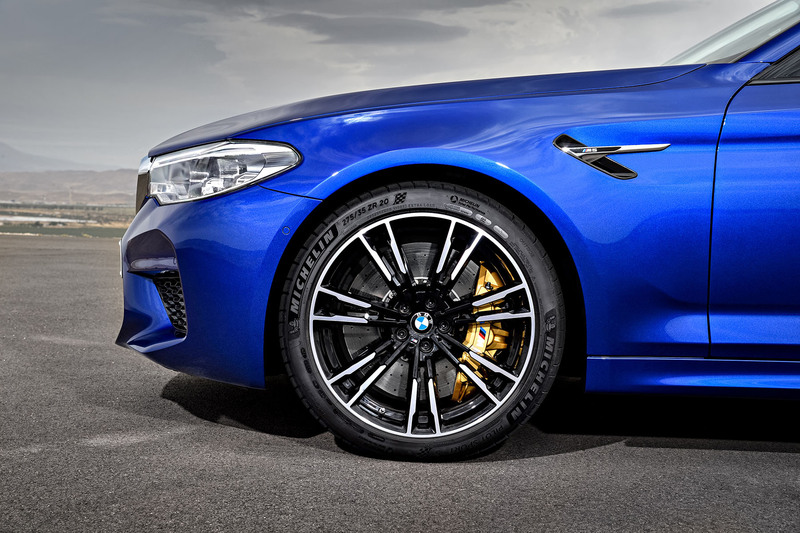 At the front and rear, perforated and internally ventilated brake discs are mounted within blue-painted six-piston callipers with a distinctive M logo designation. M Carbon ceramic brakes are also available as an option, distinguished by matt Gold-coloured callipers with M logo designation. These are 23kg, increasing driving dynamics and suspension comfort, among other things. BMW M Carbon ceramic brakes have even better performance, less fade and improved thermal stability. 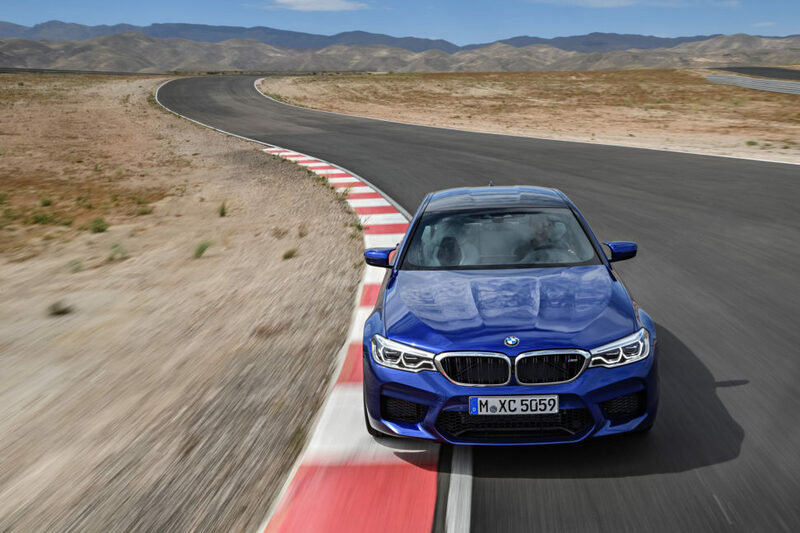 The design of the new BMW M5 is specific to M. For example, the completely redesigned front bumper with its enlarged air openings has the task of supplying the cooling systems and brakes with sufficient cooling even in race track applications. 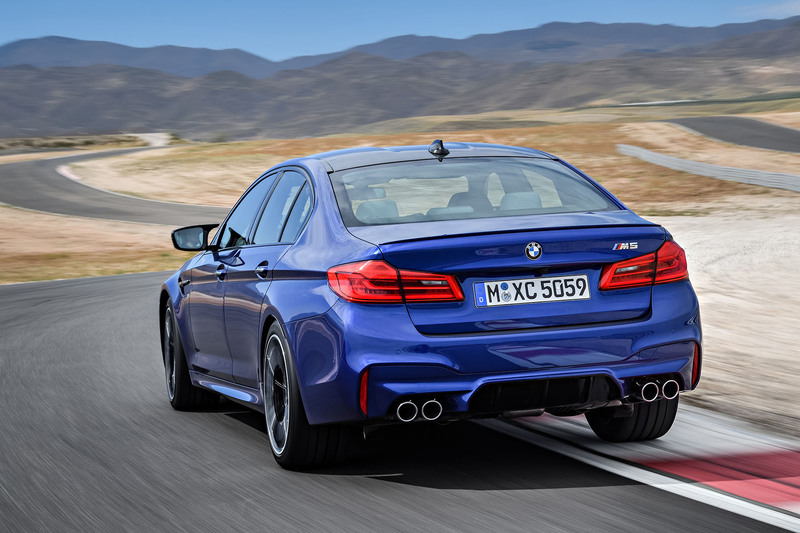 The track width is greater than the car’s predecessor, the front wings are aluminium for weight reduction and carry characteristic M-sport cooling gills. The hood is also made of aluminium, while the roof consists of a very light and stable carbon fibre reinforced plastic (CFRP) – the first time such an innovation has been used in a BMW M5. The rear diffuser was also redesigned, while the M-specific rear apron and the M rear spoiler, coupled to purposeful sill panels, all enhance the sporty and powerful appearance of the M5. The exterior mirrors are also M-specific and designed dynamically. The hexagonal, central air intake is not only separate from the side air intakes, but also integrates the oil cooler – a beautiful combination of form and function. The interior focuses entirely on the driver. Absolute control under all driving conditions is the maxim. At the same time, the new M5 offers space for up to four passengers, a large boot and high levels of comfort akin to those of the 5-Series saloon, combining the best of both worlds as a high-performance sports car and business vehicle. The M5 enjoys tremendous levels of standard equipment, all geared towards driving dynamics. The focal point is the driver’s seat, from which all switches and buttons can be operated in an ergonomically designed way. All vehicle functions are located directly in the driver’s field of vision. The large digital display from the BMW 5-Series was reconfigured specifically for M. It informs the driver about dynamic modes, the all-wheel drive M xDrive and the Drivelogic setting. The speed warning alarm is adjustable and shift lights inform the driver when it is the optimal time to change gear in manual shift mode. The data can also be reflected in the head-up display. The M5 is now started with a red start button, marking out its sporting intentions, while two red lacquered buttons M1 and M2 next to the shift paddles on the M multifunction steering wheel control the driving settings, including xDrive and DSC, as well as engine, transmission, damper and steering characteristics, plus the head-up display. The M multifunctional seats are now offered as standard and provide better support in the shoulder area. With its racing cup shape and the more pronounced side edges of seat and backrest, the M multifunctional seat offers even greater lateral support for keen drivers, with an illuminated M5 logo, finished in Fine grain Merino leather. The seats feature electric adjustment, seat heating, and a memory function. The seat depth can be electrically adjusted, along with the seat backrest width to offer the best lateral support to all shapes and sizes of driver. The new M5 is available in a variety of exterior colours, some of which are exclusively reserved for the model. A brand new shade is Marina Bay blue metallic, an intense blue colour. Also available on request are matt colours such as Frozen Dark Silver or Frozen Arctic Grey.